“Marilyn Monroe famously sang ‘Diamonds are a Girl’s Best Friend,’” Sheila Gibson Stoodley writes for Robb Report, “but collectors of her memorabilia disagree. Seven of the 10 most-expensive Marilyn Monroe items sold at auction are dresses—mainly costumes that the late star wore in her films. The few that she donned outside of the studio earn their high sums thanks to period photographs that prove Monroe wore them.” And over at his MM Collection Blog, Scott Fortner – who helped to catalogue this week’s auction at Julien’s – takes a closer look at the ‘I’m Through With Love‘ dress from Some Like It Hot, and the ‘After You Get What You Want‘ dress from There’s No Business Like Show Business. Both costumes are from the David Gainsborough Roberts collection, and will go under the hammer tomorrow. 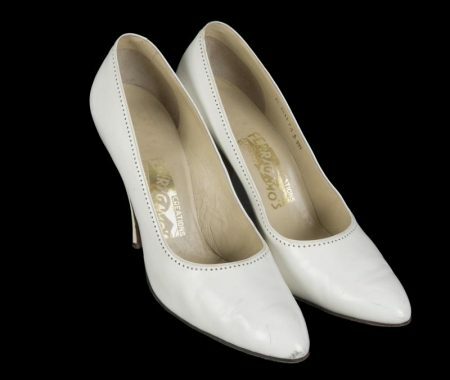 Several other items which contributed to Marilyn’s glamorous look are also among the lots. 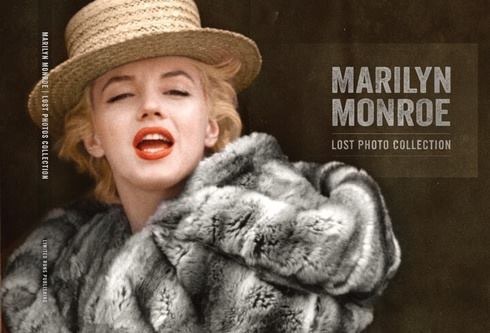 From her modelling days onward, Marilyn often wore her own clothing in photo shoots. These brown leather sandals date back to a 1950 session with photographer Earl Leaf, shot at the Hollywood home of her agent, Johnny Hyde. 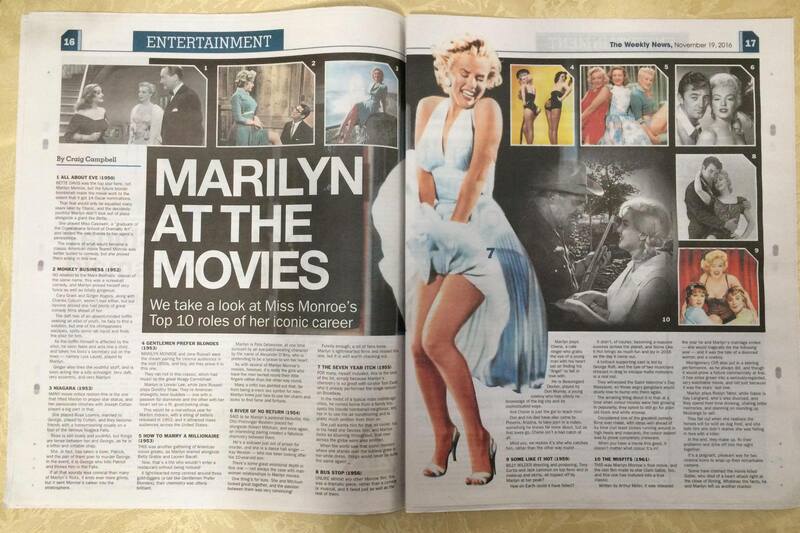 Unlike her cinematic alter-ego Lorelei Lee, Marilyn wasn’t really a material girl. These earrings, worn to the premiere of The Seven Year Itch, were made from simulated diamonds. Marilyn’s movie costumes were made in duplicates, with her name next to the Fox logo on a sewn-in label. 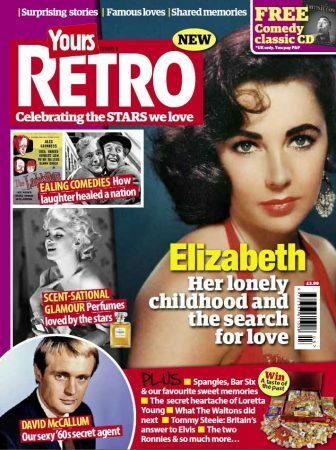 This green lace bodice from Bus Stop was won in a contest by a lucky reader of the British fan magazine, Picture Show. 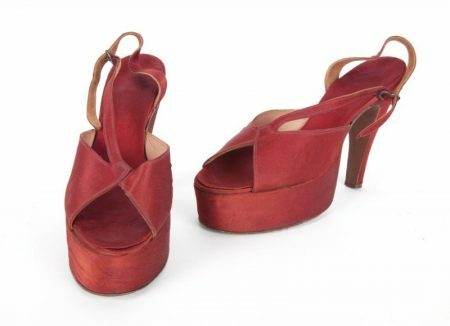 These red satin platform shoes – designed by Annello & Davide – were born by Marilyn to the London premiere of Arthur Miller’s controversial play, A View From the Bridge. 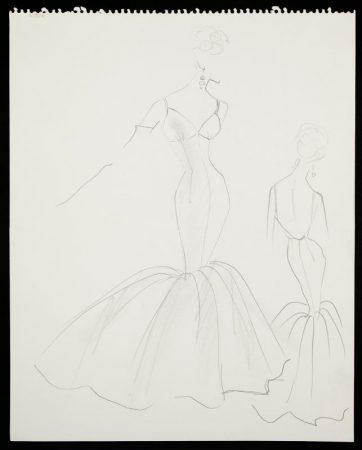 John Moore’s pencil sketches for the form-fitting mermaid gown worn by Marilyn to the premiere of The Prince and the Showgirl are also on offer. 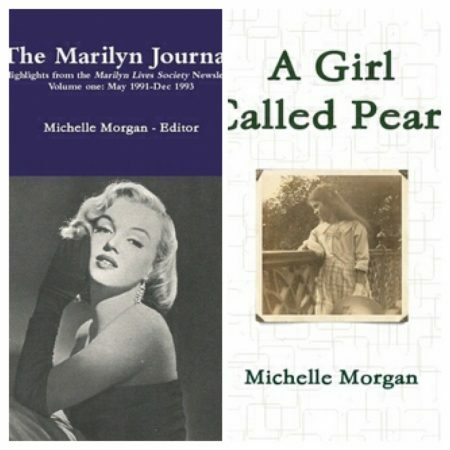 Marilyn’s personal diet plan and skincare regime are available in full. “A two-page, typed plan titled ‘Calorie Restricted Diet/ 1000 Calories/ 100 Grams Protein’ prepared for Monroe by Dr. Leon Krohn. The pages are undated, but some of the approved foods and meal plans are in line with the notations found in Monroe’s hand in the back of one of her notebooks from 1958. The diet put forth presents sound health advice even by today’s standards, recommending the restriction of sugar, fats and carbohydrates to whole wheat and ‘one small white potato boiled baked or riced’ as a substitution for one slice of bread. 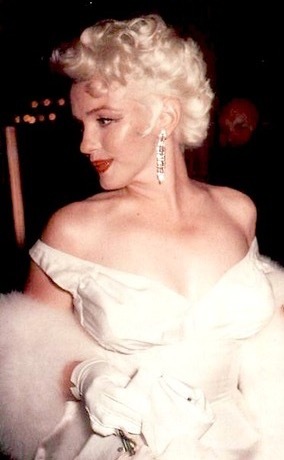 In the spring of 1958, Marilyn made plans to appear at the Cannes Film Festival. Simone Noir sent her an invitation to visit Christian Dior in Paris. 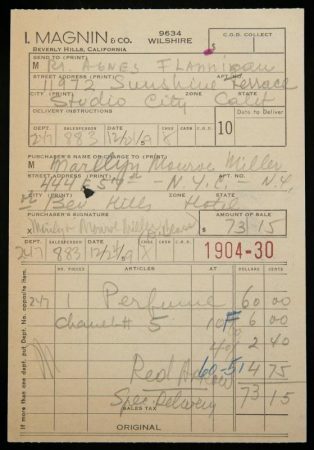 Unfortunately, the trip was cancelled, but a separate invoice shows that Marilyn bought a dress and coat by Dior from a Park Avenue boutique. 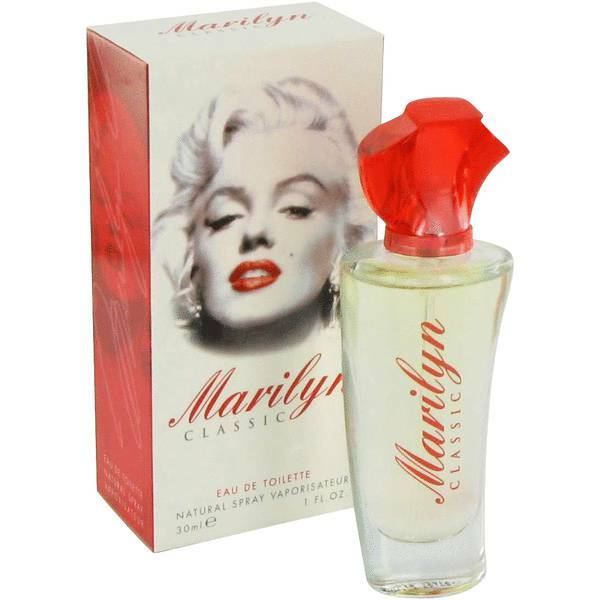 That Christmas, Marilyn’s longtime hairdresser, Agnes Flanagan, gave her a bottle of her favourite perfume, Chanel No. 5, purchased from I. Magnin in Beverly Hills. Finally, a costume sketch by Bob Mackie for Something’s Got to Give. 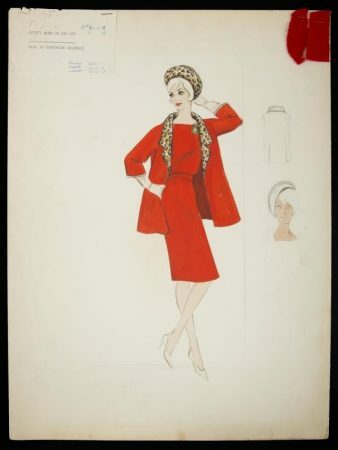 Based on a Jean Louis design, the red skirt suit with a swing jacket trimmed in leopard print, and matching hat, was intended as an ‘Outfit Worn on Day Off/Also in Courtroom Sequence.’ However, the ensemble was not worn by Marilyn during wardrobe tests, or any surviving footage from the ill-fated movie. 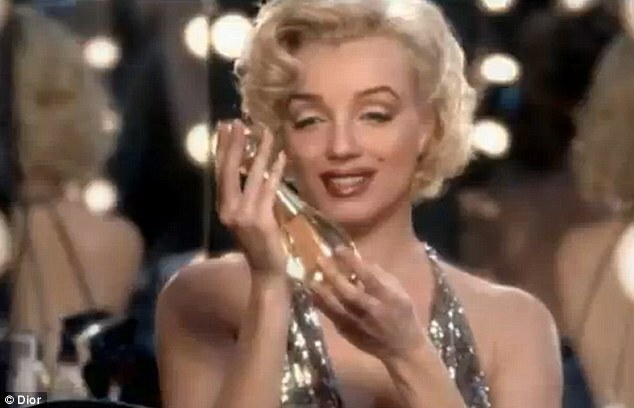 Marilyn appears – via the wonder of CGI – alongside Grace Kelly and Marlene Dietrich in a new commercial for Christian Dior’s J’Adore fragrance, starring Charlize Theron – an actress sometimes compared to MM. 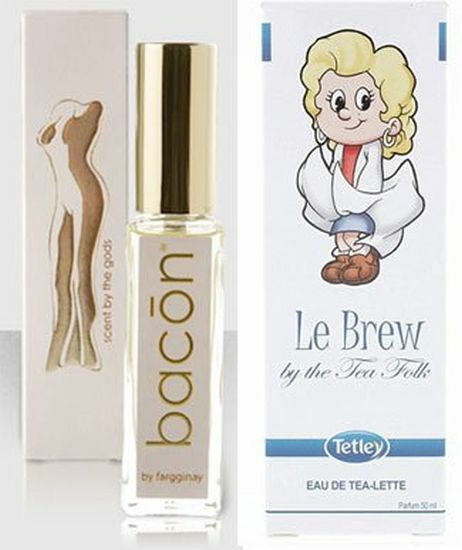 British tea company Tetley are to launch an ‘eau de tea’ perfume for £15 via their Ebay website, Metro reports. ‘Le Brew’ boasts an illustration of Tetley’s ‘Tina’ replicating MM’s famous ‘skirt-blowing’ pose from The Seven Year Itch. The research that prompted the launch of Le Brew found tea to be the fourth most popular smell in the UK with fresh bread, freshly cut grass and just washed laundry ranking above it. 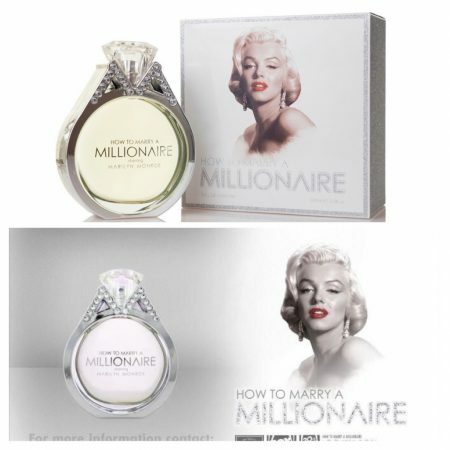 Paris Hilton‘s new perfume, ‘Tease’, features an ad campaign with the celebrity heiress posing in the style of her idol, Marilyn Monroe. ‘I am all about being alluring, but with a wink, and a fun, fresh take on all that is enticingly feminine about a woman today,’ says Hilton in a press release. Some MM fans were incensed by this comment; others, like myself, found it endearingly silly. Paris doesn’t remind me of Marilyn so much as one of the characters Monroe played, Lorelei Lee in Gentlemen Prefer Blondes. 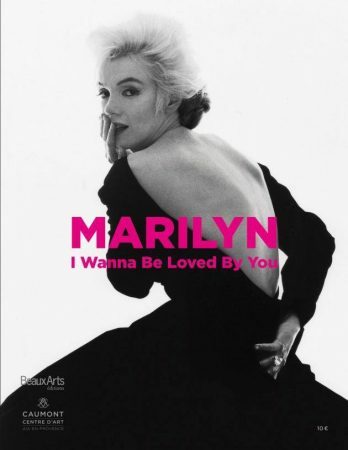 It’s not hard to imagine Paris Hilton saying something like, ‘A kiss on the hand might feel very good, but a diamond tiara lasts forever.’ But while Marilyn spoofed the gold-digger stereotype for comic effect, offscreen she was thoughtful and reserved.